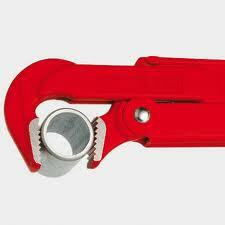 We are one of the leading and well recognized names in the field of offering Pipe wrenches (Hero Japan). 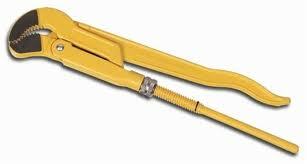 These are made available by us in two varieties - Pipe wrenches 90° and Pipe wrenches 45° (S-Type). Here, the Pipe wrenches 90° have 90" angled jaws that come with offset teeth in opposite directions. Further, these are additionally induction hardened to provide superior service life. Other than this, the Pipe wrenches 45° (S-Type) offered by us have 45° angled jaw with offset teeth in opposite directions. Coming in induction hardened finish, these feature three point gripping on pipes as well as in self gripping finish.